Are you seeking a career partner to lead you in the wright direction? 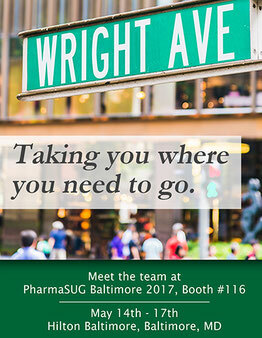 Join Wright Avenue at PharmaSUG Baltimore 2017 on May 14 - 17 at the Hilton Baltimore to connect with us and to learn about new paths of career opportunities. In attendance will be CEO/Founder, Bill Donovan, and Director of Statistical Programming and Technology, Mike Molter. Stop by booth #116 and ask us how you can regularly measure and strengthen your professional value and build a successful career in the live sciences field. See you there!